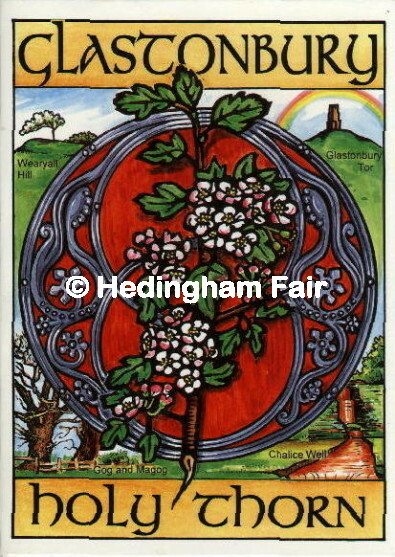 The legend of Joseph of Arimathea bringing a staff of hawthorn from the Holy Land to England, and its taking root on Wearyall Hill is remarkable for its tenacity through almost two millennia. Wearyall Hill lies to the southwest of Glastonbury overlooking the Somerset Marshes and the Bristol Channel. Near the hill there are traces of a wharf, suggesting that Glastonbury may once have been a port. According to legend, after the Crucifixion, Joseph brought twelve companions to Glastonbury and founded the first church in England. When they reached Wearyall Hill by boat, they rested. Joseph said, "Friends, we are weary all" and thrust his staff of hawthorn into the ground, where it took root and a flowering thorn tree burst forth. This particular thorn had the highly unusual property of always blooming on Christmas Day in memory of the birth of Christ. Significantly, the thorn is not native to England, but is a Levantine variety from Palestine. The famous Thorn still grows at Glastonbury, flowering on Christmas day at three religious sites. The landscape at Wearyall Hill is still dominated by a windswept thorn; a skein of the original that was destroyed by Puritan zealots during the Reformation, but not before cuttings could be taken. As well as Wearyall Hill, a large thorn tree grows in the grounds of St John's Church, Glastonbury High Street, with another in the Abbey grounds.